We in turn want to thank you for the opportunity to work on your wonderful project. We really love this project. The design team spent over 27,000 hours working on it. You know the saying “I love you to the moon and back”—we have spent the equivalent time of almost 200 trips to the moon and back! I want to point out a few design features of your new school so that when you show folks around, you can point them out as well. 1. Daylighting. We did a survey at the beginning of the project and there were a lot of daylighting comments. I hope you noticed that OHS has beautiful daylit spaces. The UW Integrated Design Lab helped us with multiple daylighting studies to make sure it is done correctly. 2. Student pride. Here are some quotes. The Library entrance graphic is formed of little O’s, representing all the students as individuals. Together they form a big O—Together Oly kids will make a big impact. The carpet uses nylon from discarded fishing nets that provided a source of income for small fishing villages in another part of the world while cleaning up their waters. This connects OHS to our world and one another. 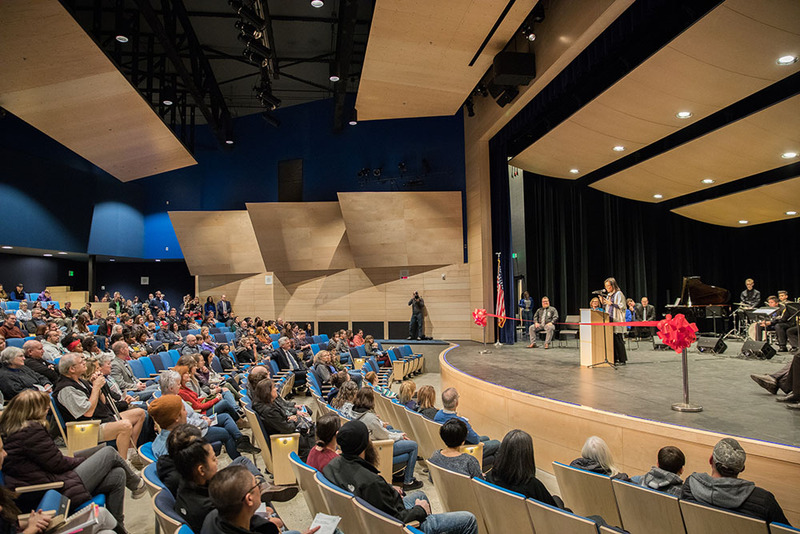 OHS is the most energy efficient school in Kitsap County. Your school uses 70% less energy than other schools. Look at this high ceiling. I hope this is tall and bright enough for the proud kids at OHS! Congratulations!